Trakt is a great service that allows people to track their TV-show and movie viewing habits through Popcorn Time, XBMC and other popular platforms. There's one problem though. Trakt is heavily used by pirates who may not realize that they're broadcasting their downloading habits to the rest of the world, copyright holders included. The service allows users to keep track of the videos they watch throughout the week, either manually or automatically via media players such as VLC, XBMC and Popcorn Time. Trakt processes and stores downloading habits so its users can keep track of what they’re watching. By default it also allows others to see this information as well, and that’s where things start to become problematic. Trakt appears to be relatively popular among pirates. A quick glance at the most popular movies shows that most are still playing in theater. These could technically all be manual entries, but the “currently watching” lists shows that this isn’t the case. For example, at the time of writing there were several Trakt users watching the latest box-office hit “Interstellar” via XBMC and Infuse. 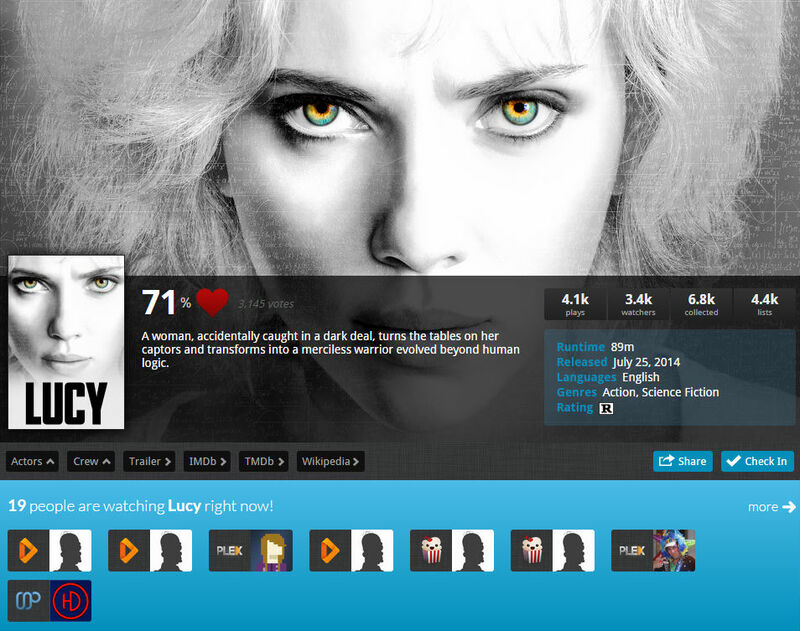 Also, the overview of the movie “Lucy” shown below lists several Popcorn Time users checking in a pirated copy of the film. Of course people have to decide for themselves if they want to display their piracy habits to the rest of the world, but they shouldn’t complain if a movie studio comes knocking on their door. We’ve just spent a few minutes looking through the profiles of several Popcorn Time users, who all display their browsing habits in public. Needless to say, this offers unique opportunities for copyright trolls. Copyright holders only have to write down a few usernames and ask the court for a subpoena to expose their personal info. Trakt is very clear about the fact that it helps private parties to enforce and comply with the law, and will have no other option than to hand over the requested information if they’re faced with a subpoena. So without too much hassle rightsholders can get their hands on pirates’ IP-addresses, email addresses, payment information, a database of files watched and at what times, etcetera. And then there’s the added risk of running into scammers. Many “pirating” Trakt users have profile images and usernames that can easily lead to a person’s identity. It took us less than a minute to dig up an email address of a Popcorn Time user, info that scammers could exploit to falsely threaten legal action while posing as a copyright holder. That’s trouble waiting to happen. Most pirating Trakt users are probably not aware of the risks above, but in any case it might be wise for the privacy minded to avoid the service.